Today only! Save in-app with code PSAVETODAY by 7pm PT. This Coupon is a 15% discount, valid from 5:00 AM Pacific Time on March 12, 2019 until 7:00 PM Pacific Time on March 12, 2019. No minimum purchase required. Discount applies to the purchase price (excluding shipping, handling, and taxes) of eligible items on the latest version of the eBay app. *Eligible items exclude warranties and protection plans, as well as items from the Computers & Electronics, Musical Instruments & Gear, Cameras & Photo, Cell Phones & Accessories, Computers/Tablets & Networking, Consumer Electronics, Video Games & Consoles, Coins & Paper Money, Gift Cards & Coupons, Vehicles in eBay Motors, and Real Estate categories. Coupon must be used within a single transaction (and can include multiple eligible items), while supplies last. Max one redemption per user. 10% in eBay Bucks on every qualifying item of $25 or more when you buy within the latest version of the eBay Mobile App (the “Promotion”). 6% in eBay Bucks on every qualifying item of $25 or more (the “Promotion”). The Promotion starts at 5:00AM PT on February 25, 2019 and ends at 11:59PM PT on February 26, 2019 (the “Promotion Period”). The Promotion applies to any qualifying items purchased during the Promotion Period that meet the minimum purchase requirement. You must activate the offer to qualify. Want to quickly try out our service without registering? Try our new basic search. Using this tool, you can set up custom eBay searches with e-mail notifications that run as frequently as every 30 minutes. No longer will you need to manually search eBay numerous times a day to find your favorite newly listed items before another buyer beats you to it. Our free service provides up to 500 automated searches a day. This can be 500 searches that run once a day, 250 that run twice a day, or any combination of search frequencies that total up to 500 per day. 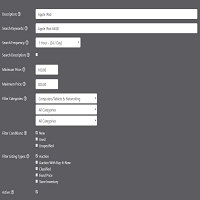 Choose your search frequency for each search you set up with options ranging from every 30 minutes to every 24 hours. Are 500 searches per day not enough? 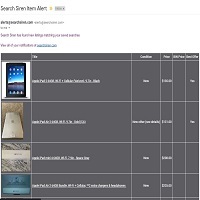 You can purchase additional daily searches through a monthly plan or we may provider additional searches for free on a case by case basis for users that make frequent eBay purchases through our notifications. Contact us through the contact form to learn more. Want to keep track of items you might purchase in one centralized location? We provide a watch list just for that. Add any item from your notifications to your watch list. Have a request for future features? Let us know through our contact form. Current improvements are already in development including sorting and filtering of notifications and watch list items, ability to exclude certain sellers from your searches, and ability to search only specific categories.